Myrna Nabhan is a political scientist and the co-founder of Cham Consulting Group, a company consulting on the Arab World. 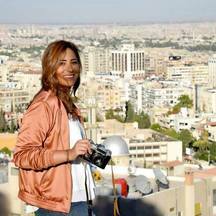 With a focus on the question of the impact of war on the fabric of society, she is a specialist on the Syrian conflict and is regularly on the ground. She directed her first doculentary "Damascus" in 2017. She's also a blogger for the Huffington Post and hosts ‘Orient Express’, a cultural show on the Middle East broadcast in Brussels. Born in Brussels of the meeting of the Levant and Maghreb, she grew up in the Middle East and Europe and lives in Damascus and Brussels. With this double culture, she tries to build bridges between cultural differences through varying media, including writing, radio, photography, conferences and the direction of films. A photo chronicle of a war that hasn’t yet ended, to bear witness to facts that have endured for too long.